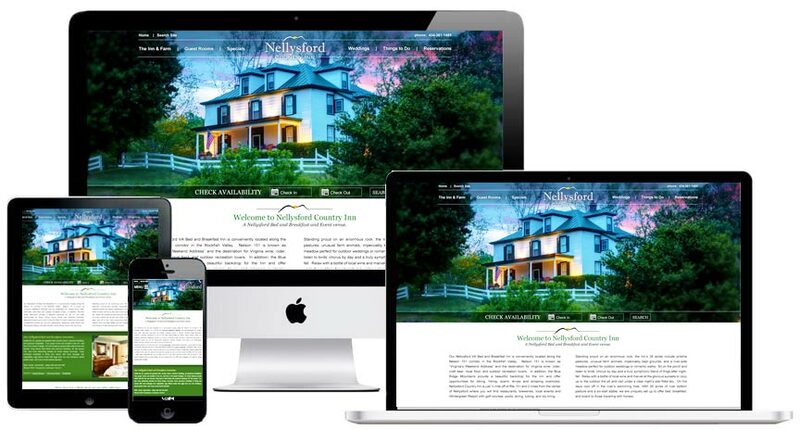 InsideOut Solutions announces a new Virginia bed and breakfast website design – Nellysford Country Inn in Nellysford, VA! We first met Mary and Richard Tousignant at the 2018 AIHP Summit, this spring in Norfolk, VA. They had recently purchased some property and were looking for a new Virginia bed and breakfast website design to suit it. A few weeks after the summit, InsideOut company president Pat McCauley traveled to Nellysford to see Mary and Richard’s new Virginia B&B. The Tousignants wanted advice on effective marketing for their new adventure. Pat spent some time getting a feel for the property, then did some research on the area and competition. Pat quickly realized that the inn’s current name was too similar to another b&b nearby. They’d have to come up with something that would help to distinguish them from their competition but also reflected the area. After some brainstorming, they realized that the solution was right in front of their noses: Nellysford Country Inn. Mary and Rich felt the name captured their location and country feel. We agree! When Pat arrived back home she briefed the team on the property. It was time to start working on marketing ideas to capture the new inn’s personality. The first step was a new logo design. Rich and Mary wanted something simple that captured the idea of the nearby Blue Ridge Mountains. Jim McCauley, print department lead, delivered with a simple yet elegant design that included the sun peaking over the mountains. After the new logo was completed, designer Beth Edwards began creating a website that would capture the Inn’s relaxing experience. Rich and Mary mentioned “rest and serenity” as goals for their inn. They want their guests to feel refreshed after a stay, so it was important that the website imparted a similar, relaxing feel. The design utilized the new logo’s colors and the beautiful green fields and trees that surround the inn, as inspiration. It was important to create an experience that was attractive and easy to use. At the same time, it needed to quickly and elegantly touch on all the inn’s offerings: lodging, weddings and horse boarding. The resulting, new Virginia bed and breakfast website design for Nellysford Inn accomplished all the stated goals. The site beautifully imparts a sense of the property’s serenity its visitors. If you’re in the market for a website, logo, or some good old fashioned marketing advice, give us a call or visit our contact page. We’re eager to talk with you about your business’s dreams, ideas, and marketing.